We machine all of our hubs and Calipers from Solid Billet 6061 Aluminum & use 14 mm Studs in all of our Hubs. 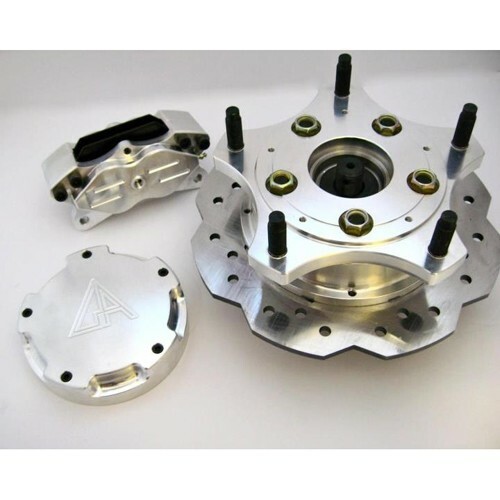 (USA Certified T6511 Billet 6061) High Strength Steel Bearing Housing with 28 Spline Stub Axle, 4 Piston Billet Calipers are CONTINUOUS FLOW and come with Hawk Racing Pads and 303 Stainless, Polished Pistons. Comes with Lightweight 6.25? Billet Race Dust Cap for quick and easy Tire Changing.